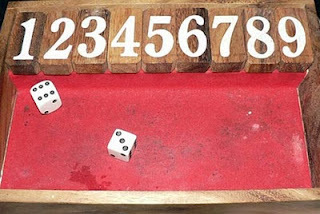 For those who don’t know the rules, throw your two dices and you may select one of the results or take the sum of the two. You flip the selected number and continue until you’re able to turn all nine numbers, whereby the word .JACKPOT. appears. If the numbers you throw have been flipped already, you lost. I’m very shy to admit but in my previous post I made a calculation mistake, playing the game over and over again, I noticed that the chance of throwing a 1 or 2 was far more higher than my predictions would allow, so I recalculated the whole thing, counting every combination from the 6 x 6 possible outcomes with two dice, with what some call a truth table. I now came to the following new graph, which shows that 9, 8 and 7 have the lowest chance, so it’s best to fill them up first, and if you can, after that, fill it up from the left. Which would mean in the above specific case always choose 9 first, not 3 and definitely not 6 which has a likelyhood of showing up four times in a winning game.